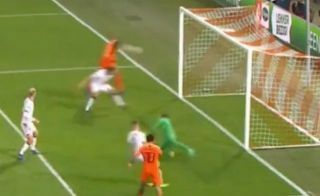 The Netherlands secured a 4-0 rout over Belarus in their Euro 2020 qualifier on Thursday night, with Virgil van Dijk even getting himself on the scoresheet. The Liverpool defender is enjoying a fine campaign thus far, as he continues to lead from the back as the Merseyside giants challenge for the Premier League title and Champions League. He took that form into the international break with him too it seems, as aside from helping the Dutch keep a clean sheet in their opening qualifying match in Group C, he also popped up in the opposition box to score a fourth goal late on. As seen in the video below, Van Dijk shows great awareness and positioning to get himself in a great spot to pounce on the cross as he produces a bullet header from close range to wrap up the victory. He’ll certainly be hoping that he can score a few more goals between now and the end of the season to help Liverpool win major honours to cap off what has been a very impressive campaign for him on an individual level.